With the rapid development of technology, the jobs that will exist for our next generation haven’t even been invented yet. And this makes it even tougher for today’s students. Along with learning math, science and writing, kids also have to learn how to be inventive, resourceful and imaginative. Our new entrepreneurial economy requires individuals to be both independent workers and successful collaborators, but luckily, one of the best ways to teach the critical thinking and social skills is through the arts. But do executives and hiring managers understand the value of the arts in today’s workforce? 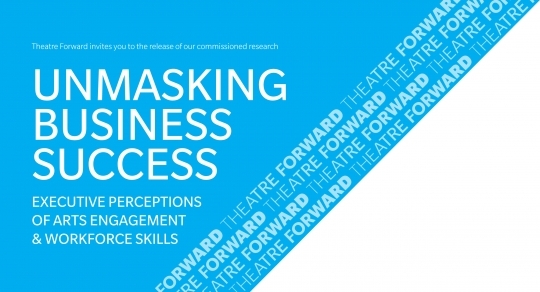 On Thursday, October 8, 2015, Theatre Forward hosted a panel discussion, Unmasking Business Success: Executive Perceptions of Arts Engagement & Workforce Skills, at the Microsoft Conference Center in New York City that addressed this pressing question. 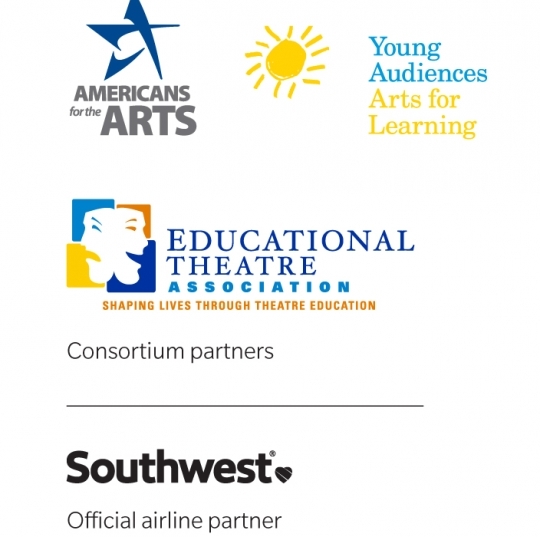 Young Audiences Arts for Learning was a consortium partner for this event. Theatre Forward released findings from a report that investigated how executives perceived the impact of the arts on today’s workforce. The panelists commented on the findings of this report and how an arts education is a necessity to survive in today’s workforce. 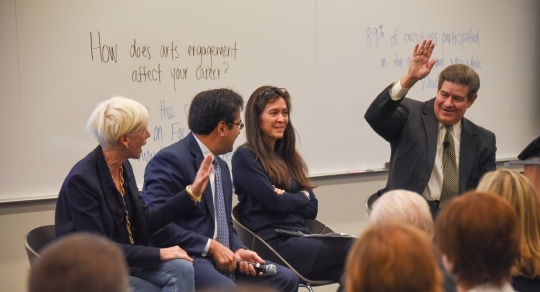 The panelists included Joanna Coles, Editor-in-Chief, Cosmopolitan; Diane Paulus, Artistic Director, American Repertory Theater; and Luis Ubiñas, Advisor, Investor and Corporate Board Member. The panel was moderated by James S. Turley, Theatre Forward Chairman. To read more highlights from the event’s discussion, click here. The survey was funded through a grant from The Schloss Family Foundation and Shugoll Research conducted the exploration into the role arts education plays in workforce development.  Despite believing arts education improves workforce skills, the research found that few executives believe it is the role of corporations to directly support expanded access to arts skills. Most feel that arts organizations are not communicating the benefits of these skills to them as employers. At Young Audiences Arts for Learning, we are working to address this concern with our arts integrated internship program called ArtWorks. Just one of many programs, ArtWorks provides students across the country with the opportunity to use their passion for creativity to build confidence and gain essential and practical job readiness skills to maximize their potential as they prepare to enter the 21st century workforce. Through this program, students learn problem-solving skills, critical thinking, teamwork and collaboration, professionalism and develop a strong work ethic – all the crucial skills today's employers seek in candidates for employment.